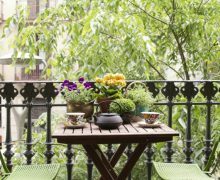 A small condo balcony or terrace can be transformed into an additional outdoor ‘room’ with some strategically placed plants, colourful accessories and a seating area for relaxing or enjoying a meal. First, take some time now to clean & repair your outdoor furniture. If you need something new, sale items are pretty much everywhere; however, second-hand shops and flea markets may offer recycled, unique items that don’t cost a lot of money. Second, find out what direction your balcony/terrace faces, how much sun it gets and for how long so that you can optimize the growing season. Plants are available in a huge range of colour and size – a quick trip to your local gardening store can help you sort through the choices. Pots and planters also come in a range of sizes, colours and textures to fit the perfect spot on your balcony or table. 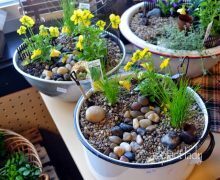 But don’t stop at just pots – pretty cans, jars, boxes, and even rubber boots can be planted so long as the plants have proper drainage. Add trays under your planters to prevent soaking your neighbours below when you water them. 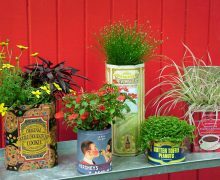 Speaking of watering cans, why not get a decorative one to add to your overall scheme? Accessories such as cushions can add comfort and a pop of colour where needed. If you leave them outside, make sure they are weather-resistant – rain and sun can fade fabrics dramatically. For some, a BBQ is a must-have item. 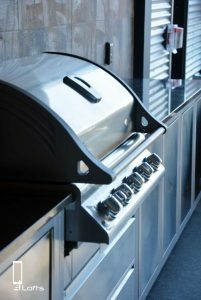 For others, the BBQ terrace at Q Lofts is the perfect fit for cooking and socializing. As always, don’t forget to check your condo by-laws for any restrictions or permissions you’ll need from your Board before making any changes or additions to your outdoor space. No matter how much space you have, you can create a lovely outdoor oasis for yourself with careful planning and attention to detail!